If you're like us, you use your iPhone 5 for everything on-the-go: talking, texting, using your favorite apps, watching videos, the list goes on. Sometimes you forget to charge, and then you're out and about, stranded, with no outlet in sight. That's where our Grip Power Battery Case comes in. One part powerful battery pack, and one part stylishly protective case, you'll never have to worry about running out of juice again. The powerful, rechargeable 2000 mAh battery capacity means you can talk, text and browse the web twice as long on one charge than with your phone alone. It's so easy to use - just press and hold the power switch to turn the battery power on and off, and press it once to see the battery's status. 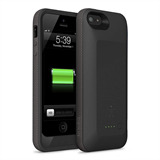 The Belkin Grip Power Battery Case comes with a Micro-USB charging cable: just plug the cable into the side of your case, and in one charging session, you'll have full iPhone power and backup power whenever you need it. 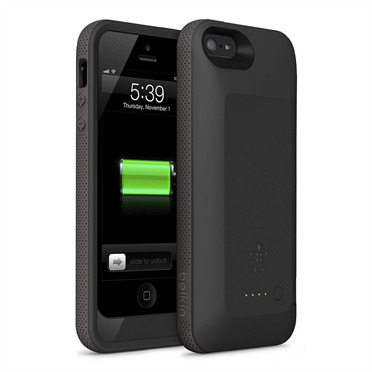 Putting on the Grip Power Battery Case takes just two simple steps: First, slide your iPhone 5 into the battery pack and connect it to the built-in Lightning connector. Then, snap on the outer shock-resistant bumper. In seconds, you're fully powered, fully protected, and ready to go. Our Grip Power Battery Case doesn't just extend your iPhone's battery life - it also protects it. The secure-hold grip design keeps your phone from accidentally slipping out of your hand, but in the case it does get dropped or bumped, the shock-resistant material has you covered. Another great feature is the Anti-Glare Camera Ring that doesn't get in the way of your camera flash, so you can keep on snapping great pictures.